Airless Tires Market size was valued at over USD 120 million in 2016 and its demand is projected to reach around 139 thousand units by 2024. 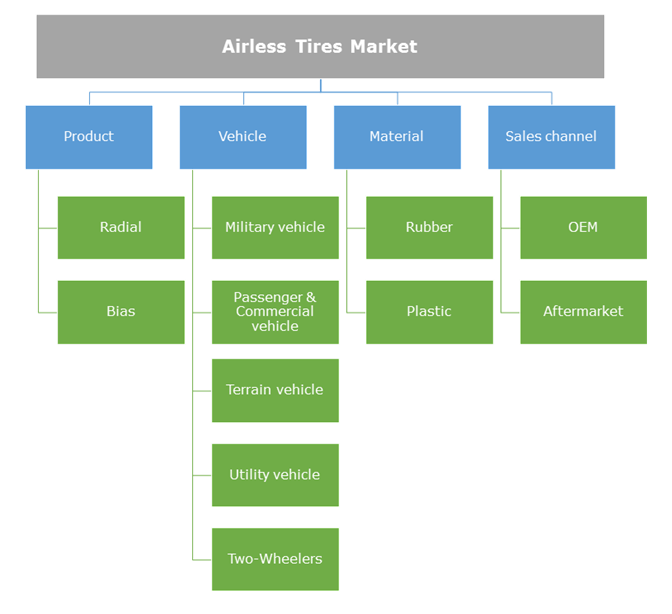 Rising acceptance from heavy commercial and off-road vehicles coupled with high deployment in military segment, especially in developed countries of North America will primarily drive the airless tires market share over the forecast timeline. Proliferating demand of utility vehicles such as lawn mowers, golf carts, etc, will further escalate the revenue generation. Major tire manufacturers across the globe including Bridgestone, Michelin, and Hankook are investing heavily on R&D for the development of these tires, inducing immense growth potential to the airless tires market size till 2024. Non-pneumatic tires are currently produced by recyclable plastic or rubber, making them eco-friendly in nature. Moreover, provision of benefits such as durability, puncture proof, and rugged applications will further strengthen the product penetration. However, excessive manufacturing cost coupled with low awareness about their benefits may hamper the non-pneumatic tires market growth over the forecast timeframe. Limited performance in case of friction, suspension, and high speed will further impact the airless tires market negatively. Rising focus of governments on agricultural sector across the globe has resulted in increased demand for agricultural machinery, leading to increased production of airless tires. Manufacturers are focusing on overcoming the challenges associated to these tires such as vibration and noise by regular technological advancements. For instance, Bridgestone developed tires of contact area information system (CAIS). These tires are equipped with sensors that are responsible for monitoring the road surface and communicating real time information with the driver. Most airless tires market participants are continuously focusing on mass production of these tires. For instance, Bridgestone has been developing airless tire design that is anticipated to be adopted in bicycles and two wheelers by 2019. Similarly, Hankook has been developing a non-pneumatic tire model. Michelin is selling its tire, “Tweel” for commercial vehicles including such as lawnmowers and front-end loaders and for terrain vehicles. These regular developments for different applications will pave opportunistic ways for the airless tires market growth over the next eight years. Radial tires are expected to capture over 65% of revenue share by 2024. High preference of non-pneumatic tire manufacturers towards production of radial tires will primarily support the substantial revenue generation. Rising demand from commercial vehicles will further strengthen the product penetration. 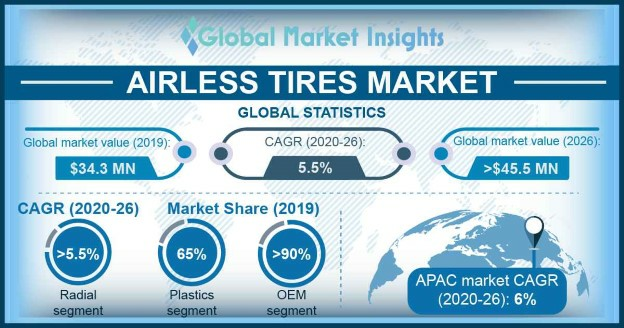 Moreover, provision of the benefits such as higher flexibility, enhanced strength, better shock absorbing capacity, and lesser fuel consumption than its counterpart is another factor positively impacting the airless tires market growth over the forecast timeframe. Bias tires will exhibit over 9% CAGR from 2017 to 2024 owing to high usage of these tires in heavy trucks and buses. Developing economies such as India and Indonesia are witnessing high deployment of these tires in heavy commercial vehicles, further supporting the industry growth. Cost effectiveness as compared to its counterpart is another factor positively impacting the airless tire market from bias tires. HCV is anticipated to generate a demand of over 37 thousand units by 2024, accounting for more than 27% of the global airless tires market share over the forecast timeframe. These vehicles are equipped with airless tires to engage in rugged activities and carry more weight. Owing to these features, the manufacturers are increasingly preferring these tires, fostering the industry growth. Major industry players such as Michelin are focusing on development of these tires for heavy vehicles, further offering growth opportunities for this segment. Military vehicles will exhibit around 9% CAGR from 2017 to 2024 owing to high usage of airless tires, especially in developed countries such as U.S. Industry participants are developing non-pneumatic tires for military and defense sector, positively impacting the product penetration. For instance, in October 2012, Polaris introduced a non-pneumatic tire at U.S. army’s annual meeting and exposition. The e-commerce platforms such as Alibaba have also included military airless tires in their product offerings, thereby, strengthening the airless tires market demand over the coming years. Airless tires market from plastic is expected to account for over USD 135 million over the next eight years. Plastic is highly recyclable, and therefore, preferred by the manufacturers in their production. For instance, in February 2011, Bridgestone developed an airless tire with recyclable plastic. Similarly, in April 2017, the company manufactured tire for two-wheelers with plastic spokes. Cost effectiveness as compared to its counterpart is another factor supporting the industry dominance. Rubber will showcase a declining revenue share over the next eight years. It is a natural resource with continuously increasing costs across the globe. Moreover, the stringent regulations regarding the usage of rubber such as REACH in Europe may further curb the airless tires market growth over the forecast timeframe. 21’’-25” tires are expected to dominate the non-pneumatic tires market, capturing over 33% volume share over the forecast timeframe. High deployment of these tires in HCVs and LCVs will primarily drive the industry growth. Moreover, they are increasingly being used in terrain vehicles across the globe, further escalating the airless tires market revenue generation. Tires above 35” will showcase fastest growth, exhibiting around 10% CAGR till 2024. These tires are generally used in military vehicles and other heavy vehicles used in construction & agricultural sectors. Rising demand for airless tires from military vehicles will foster the airless tires market growth over the coming years. OEMs will account for approximately 94% of airless tires market size till 2024. Since airless tires are not yet commercialized on a larger scale, they will primarily enter OEM market post manufacturing. This will majorly support the industry dominance. Moreover, the process of maintenance of safety standards is well handled by manufacturers. Durability, better service, and provision of safe driving conditions are other factors, further impacting the industry positively. Aftermarket is likely to exhibit over 10.5% CAGR over the next eight years. Non-pneumatic tires market will witness high replacement needs in the near future with the prominence of these tires across the globe. The shifting preference can be attributed to their quality features. Cost effectiveness is another factor propelling the airless tires market growth. Asia Pacific is anticipated to dominate the non-pneumatic tires market, accounting for over 34% share by 2024. Substantial production of military and commercial vehicles, especially in China and India will primarily drive the airless tires market growth. Initiatives from major manufacturers for the development of these tires will further support the region’s dominance. For instance, in October 2017, Sumitomo Rubber Industries displayed airless tires at Tokyo Motor Show in Japan. Moreover, the company is expected to supply its product to Toyota for their electric vehicles. North America airless tires market will capture significant share crossing USD 56 million over the forecast timeframe. High demand of airless tires across the region, especially from military sector will contribute the revenue generation. Prominent industry players are providing airless tires for military sector in the region. For instance, Michelin and Resilient Technologies have been providing these tires to the U.S. military. Michelin, Goodyear Tire and Rubber Company, Bridgestone, and Hankook are among the prominent players in non-pneumatic tires market. Other noticeable participants include Resilient Technologies, Toyo Tires, and Sumitomo Rubber Industries. Geographic expansion is among the major strategies adopted by the industry players to strengthen their presence in the airless tires market. For instance, in November 2014, Michelin opened first manufacturing plant, solely dedicated to the production of airless radial tires for commercial vehicles. New product development is another strategy that has continuously gained traction among the industry players. For instance, in July 2016, Hankook announced the completion of testing process on its iFlex airless tire. Further, the company announced that the tire is totally composed of environment-friendly materials. This innovation helped the company to enhance its visibility in the airless tires market. Airless tires generally refer to the next-generation tires that no not require air and eliminate the need of air pressure. They can be based on honeycomb or spokes structure and are being developed using 3D printing method. These tires are majorly manufactures using plastic or rubber. Their benefits as compared to the conventional tires will primarily drive the airless tires market growth over the coming years. These benefits include puncture proof, durability, and high application in rugged activities. Several automobile OEMs are considering the usage of these tires to reduce the overall vehicle weight. For instance, in October 2017, Toyota announced that it is considering airless tires for their battery and fuel cell electric vehicles for reduction in their weight.